The items above were waiting on our desk when we got back from vacation Friday (yeah, that's how we roll). What you're looking at is Alcopop! Records' excellent comp We Grew Up On A Diet Of Jurassic Park And Sensible Soccer (And All We Have Left Is This Lousy Record Label), which comp was the venerable label's 50th release and was sold in a number of different bundles, such as one that included the radical Alcopop! jacket, also pictured, because, again, that is how we roll. 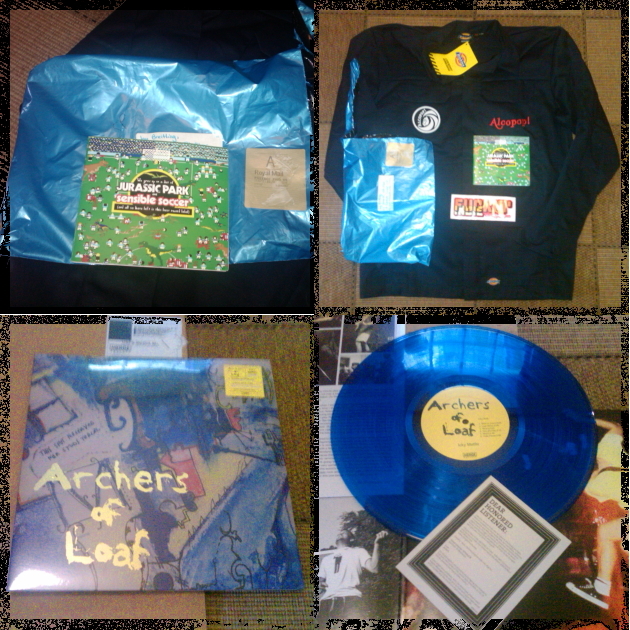 Also above: images of the wonderful reissue of Archers Of Loaf's seminal debut full-length Icky Mettle, which came on BLUE VINYL, FOOL in a marvelous gatefold package with a poster, sticker, and download code for a bunch of digital extras including a remastered version of the greatest EP of all time, Archers Of Loaf's Archers Of Loaf vs. The Greatest Of All Time. Money well spent. We buy records. And we listen to them. And sometimes we play them for you. Like, for example, this coming Thursday, when we co-host New Music Night with Brad Almanac at the fabulous River Gods drinkery in Cambridge, Mass. We can assure you that we are going to play at least two tracks from the Alcopop! compilation. You'll want to hear that, so come out. More info at the Facebook event pagina.